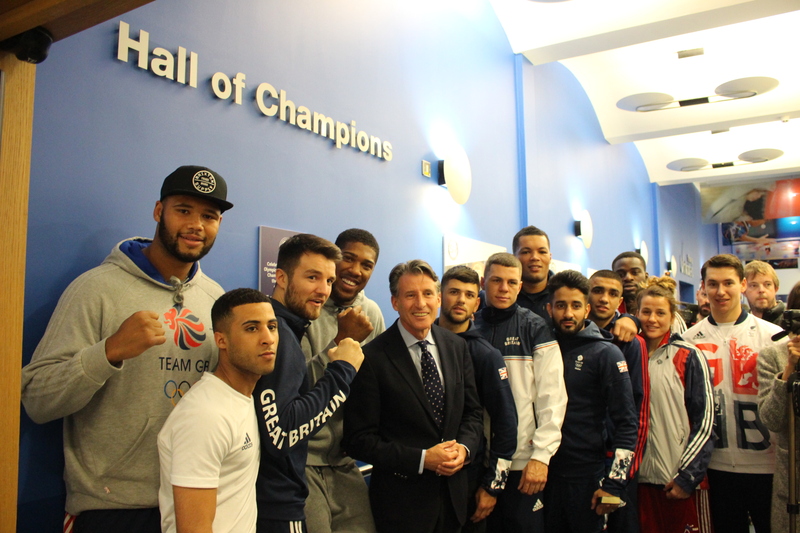 London 2012 Olympic Champion, Anthony Joshua was joined by four time Olympic medalist, Seb Coe in opening the new-look Hall of Champions at the English Institute of Sport, Sheffield. The EIS-Sheffield is home to many sports including boxing and was home to Anthony Joshua during his time on the GB Boxing programme. After the success of the Team GB athletes at the Rio 2016 Olympic Games the EISS Hall of Champions was today reopened and new photos unveiled. The Hall of Champions was originally opened by Seb Coe in 2009 and displays images of sporting heroes that have trained at the English Institute of Sport, Sheffield. Anthony Joshua is one of the athletes whose image is displayed in the Hall of Champions, he’s accompanied by fellow GB Boxer, Nicola Adams. Other athletes featured include Will Bayley, Rob Davies and David Smith. GB Boxing’s Rio 2016 Olympic bronze medalist, Joshua Buatsi and silver medalist, Joe Joyce attended the event along with their GB Boxing teammates.